We aim to safeguard our children at all times. Please read below our website policy. The aim of this Website Publishing Policy is to ensure that pupils will benefit from learning opportunities offered by the school’s website, in a safe and effective manner. Photographs of individual children will not be published on the school website. Instead photographs will focus on group activities. Personal child information will be omitted from school web pages. Where a child is part of a group photograph his/her full name will never be included with the picture, first names only may be mentioned. If it is your wish that your child’s photograph not be included in group pictures on the website please write to the school to inform the principal. Please ensure that you specify your child’s class and teacher. Any incident of an image considered by a pupil, staff member or parent to be inappropriate to the website or these guidelines should be reported to the principal. The person reporting may choose to do so anonymously, but must give reasons why they feel the images is not appropriate. Pupils will be given the opportunity to publish projects, artwork or school work on the World Wide Web. A teacher will coordinate the publication of childrens’ work. The term “work” is used to imply drawings, written text, video and/or audio clips. Children's work will appear in an educational context on web pages with a copyright notice prohibiting the copying of such work without expressed written permission. Emails from other Internet users will be directed to the school e-mail address, and personal e-mails will not be set up for children. An ever-increasing number of organisations and institutions are linked to our website. Scoil Oilibhéir Naofa is not responsible for the contents or reliability of the linked websites and does not necessarily endorse the views expressed within them. Listing shall not be taken as endorsement of any kind. We cannot guarantee that these links will work all of the time and we have no control over availability of the linked pages. Most of the material featured on our website is subject to copyright protection unless otherwise indicated. Childrens’ work can be published on the Scoil Oilibhéir Naofa website but remains the copyright of the child. If any work found on the school website is reproduced, published or issued to other, the source and copyright of the work should be acknowledged. Where material from other sources is published on our website we endeavour to acknowledge the source and copyright status of that work. 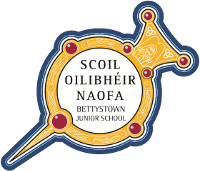 Any transgressions you are aware of should be directed to the school by, principal@bettystownschool.ie, indicating the page(s) which you believe are not compliant with our policy or general web etiquette. Scoil Oilibhéir Naofa hereby grants visitors to this World Wide Web site access to these pages conditional upon your agreement to accept the application of the laws of Ireland to govern matters between us in relation to this web site and you agree to indemnify us and not hold us liable for the result foreseeable of any actions you may take based on the information contained herein. Finally this policy will be published on the Scoil Oilibhéir Naofa website, and it is envisaged that school and BOM representatives will revise the School Website Publishing Policy annually. It is the school’s policy to celebrate your child’s work and achievements. Photographs may sometimes be taken by class teachers for classroom and school displays of your child individually, participating in group class activities, during assemblies and special school events. Images of your child and his/her work may appear on our website. At no stage will your child be identified by name.